Back Strengthening exercises are an important part of any exercise routine. We encourage our participants to think of back strengthening exercises as important to include in your daily routine as other activities like brushing your teeth for dental hygiene or maintaining a health diet to manage your weight. Our body consists of muscles, bones and other tissue like the tissue that make up our organs and more. If we didn’t have a skeleton we would be a bag of tissue held together by our skin. The skeleton is like a scaffold, it’s our internal frame. Each bone connects to other bones usually with a bit of cartilage in between the bones. The bones are held in place by ligaments and tendons that connect to the musculature. Muscles move the bones. For a muscle to be able to move a bone relative to another bone it has to reach across a joint. When a muscle tightens up, when it’s active, it shortens and thereby it reduces the distance between the two point it’s connected, too. To demonstrate, if you are in a sitting position, straighten your left arm out in front of you with your palm facing upward. Place the right hand on the biceps of the left arm while holding your arm out. Keeping your left arm out, bend your elbow bringing your left hand to your shoulder. The left lower arm moves towards the upper arm. You can feel the biceps move as it bulks up and in this case shorten, with your right hand. The biceps reaches across the elbow joint and shortens the distance between the lower arm and the upper arm. This movement is called flexion. For every muscle that shortens/flexes and moves a body part in one direction, there has to be a muscles to do the same to reverse the movement. 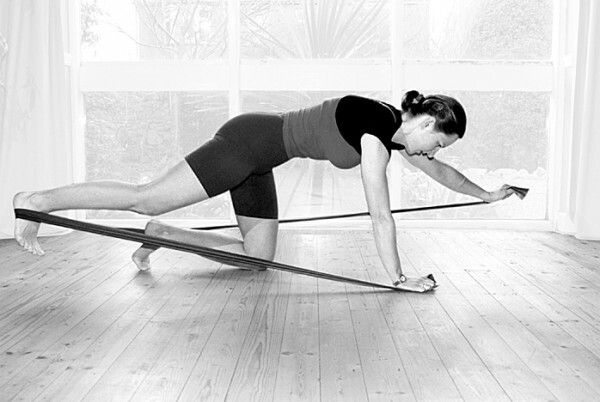 The reverse movement to flexion is called extension. In the case of your arm, this movement is done by the triceps. We refer to the two muscles as an antagonistic pair, because they work in opposition to each other. Not all muscles are ‘big movers’ like the biceps. We have muscles that don’t have much movement ability at all, they have merely a static function, they hold. We also have many muscles that work as a team, they work together to allow us to do complex movements. You can for example bend and rotate the elbow and lower arm in one fluid co-ordinated move because there is an entire muscle group involved in the motion. Looking at the overall body again we have to realise that the skeletal system that is our internal frame is literally strung together by a complex set of pulleys and movers. All these muscles act in opposition to another, an antagonist. Using another model image, it helps to thing of the upright body much like a mast on a sailing boat. The mast in a boat is usually held up by four strong wires. If you were to cut any one of the ties that ancor the mast to the hull the mast would becomeseriously unstable and possibly fall over. Let’s look at the human body again. 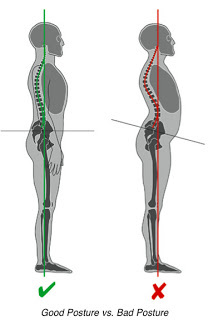 The main muscles that keep our upper body straight and upright in a standing position are the muscles of the back (erector spinae) that reach across the entire back from the hips to the head. 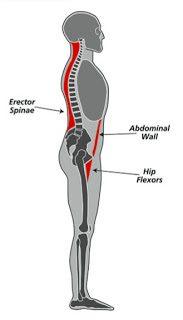 As their antagonists we have the muscles of the abdominal wall and the hip flexors. (There are other muscles affecting a good spinal position and posture for example the muscles in your buttocks and the muscles of you chest. We will deal with those at a later stage). If one of the muscles involved in holding our body upright is weak or extremely tight and exerting too much of a pull, the balance will be off. Many people who have back problems tend to have weak muscles in the abdominal wall. As a result the pelvis isn’t held upright but it falls forward. The curve in the lower back increases. The muscles in the lower back can be weak too. They can strain and tighten up. The muscles of the hip flexors tend to be the strongest of the set. We use them all the time because we work them when we are walking pulling the thigh up. For a healthy back it is important to regain and maintain the balance of these muscles. For any back strengthening exercise to be effective you need to also strengthen the abdominal musculature. It is equally important to stretch and thereby lengthen the muscles that are too tight, mainly the hip flexors and the muscles of the lower back. If a person engage in activities or exercises in an upright position that is load bearing (while they are on their feet) without having a healthy muscle balance they can greatly exasperate their back problems. It is therefore essential to strengthen and stretch these muscles on a regular basis. This entry was posted in back strengthening exercises, posture, spinal health and mobility on December 15, 2013 by flying form. Our Program provides people with a set of back strengthening exercises to help them with their back problems. However for this program to be even more effective we encourage people to know about the cause of their back problem too. It is equally as important as regular back strengthening exercises. When you reduce and avoid the movements habits and bad posture that caused the problems in the first place the back strengthening exercises will be most effective. Most people are only aware of one back problem, which is back pain. Some people are aware that posture irregularities or injuries to the back are a back condition, too. However, a back condition can silently grow or exist, very similar to a heart condition, and not show until substantial damage has manifested itself. Most back problems are created mechanically. They are the result of the bones of the spine (vertebrae) moving out of their optimal, natural position. As the spine creates the link between the central nervous system and all other parts of the body, nerve functions can be damaged or reduced without you feeling something or major pain. To gain a better understanding, we need to examine the structure and movement ability of the spine in detail. Think of the spine as a structure of segments (vertebrae) with cushions (disks) that protect these segments and allow movement and mobility. 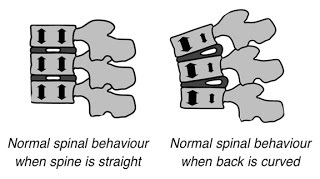 If the spine is bent in any of its natural possible directions, the disk between two vertebrae acts as cushion that simply allows this movement to take place (see drawing). As we get older there is a natural degeneration in the cushion through wear and tear. Similar to a cushion we sit on, which goes flat over the years, the disk material gradually gives under the pressure of the bones they move and carry. This degeneration leads to increasing stiffness in the joint. Bad posture, back damaging work practices and effects of injuries can have a continuously stressing effect increasing the pressure on one or more disks and can dramatically speed up the process of wear and tear. As part of this degenerative process, a vertebrae or disk might start to press on nerve tissue interfering with nerve functions causing pain, tingling sensations etc. Back problems or back pain can also be caused by the continuous tension of a muscle through bad posture, extensive strain or after an injury. The muscle tightens up and goes into a spasm. These tight muscles bulk and can press on nerves passing in and out of the vertebrae creating symptoms such as numbness, tingling and other problems. In any case, if you experience pain in your back you must consult a doctor and clarify the source of the pain, prior to commencing an exercise class. This is simply necessary because some back pain might be the result of a condition that would require special medical attention (eg. tumours, osteoporosis). Specific and specialised exercise programmes are a key element in treating many conditions associated with back pain. It is always recommended to exercise as a preventative measure simply to maintain or improve health to keep the body in a physically well-toned condition. In the next post we will examine how the muscles in your back and exercise affects your posture. You will learn what type of back strengthening exercises are the most beneficial for your back problems. This entry was posted in back strengthening exercises, posture, spinal health and mobility on December 12, 2013 by flying form. Back strengthening exercises should aim to improve muscle tone if they aim to help people with back problems and back pain. A lot of people feel, they only get a good workout, when “it hurts”. Short spurts of maximum intensity are perceived as more effective than medium intensity exercises over a longer period of time. Whether or not this is really the case is currently a source of hot debate in the science and research world. Some research suggests, the time a muscle is engaged has a better training effect than the actual strain intensity. My words of wisdom here are based on my experience working with people in my program and focusing on core and back strengthening exercises. There is no problem pushing the intensity level provided proper technique is maintained. So, while you can up the intensity level by using weights doing core and back strengthening exercises, at no point should the core stability or joint position be compromised. And you should spend time in the position itself. You need a bit of both – medium to high intensity exercises which are performed slowly and in a controlled manner. The aim of any exercise program should be to improve your health and fitness. I encourage all my course participants to evaluate any back strengthening exercise program or other kind of activity themselves. Are the exercises controlled and are the movements done in a manner without compromising the joints or muscle capabilities? See our guidelines for more information. Although weights can be a useful tool when exercising, they are not necessary for an exercise to be effective. By altering the body position and increasing the leverage, any of the back strengthening exercises we do, can be made sufficiently difficult, so that you get a training effect. However, when properly used, weights can make a back strengthening exercises program that little bit more varied and interesting with higher levels of intensity attained that little bit quicker. The ball is a great tool when doing a back strengthening exercises program. There is an entire set of stability ball exercises which will strengthen your core and back. We also use a number of small weights and do a lot of resistance training using a Thera-Band. This entry was posted in back strengthening exercises, ball exercises in work, stability ball exercises, stomach exercises on November 26, 2013 by flying form. Back strengthening exercises are easily done while in work. Just taking a few minutes throughout your working day can make a huge difference in your well being. 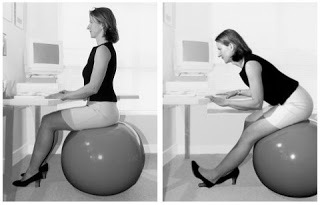 Sitting on a ball is one of the easiest ways to keep your back active and healthy. The ball is an important component of our active sitting program. The following exercise is one of the most effective back strengthening exercises. It will exercise your legs, stomach and back all at the same time. Keep you stomach muscles tight by pulling your stomach in throughout the exercise. Make sure you keep on breathing. 1. Have your knees at least shoulder width apart, place your ankles directly beneath your knees on the floor. 2. Place your hands on the edge of the table and lift your buttocks off the ball, keeping the knees over the ankles Your stomach muscles should be tight while you keep breathing. Ensure you are not leaning on the table top. 3. Make sure the ball hasn’t rolled away before you sit back down. If you find the ball rolls away you might want to use a ball base. 1. As before have your knees over your ankles and bring your upper body forward. 2. Place your hands on the outside of the ball next to your hips. 3. Bring your upper body forward until you are able to lift your buttocks off the top of the ball. Check your knees are still above your ankles. Hold for 5 to 10 seconds. This entry was posted in back strengthening exercises, ball exercises in work, stomach exercises on November 24, 2013 by flying form. Stretches for lower back pain include hamstring stretches. Stretches for lower back pain are just as important for a healthy back as stomach and back strengthening exercises. Many people don’t realise how important leg strength, flexibility and mobility are for the back. In order to be able to move in a back friendly way, we need to keep the legs strong and flexible. Prolonged sitting often results in shortened hamstrings. As a result the muscles balance that keeps the back healthy and upright gets disturbed. This can result in back pain. Stretches for lower back pain include leg stretches such as the hamstring stretch. Stretches for lower back pain also include the hip flexor stretch we introduced in the last post. As with hip flexor stretches we encourage you to stretch the hamstrings on a regular basis, too. 1. Start by sitting on the exercise ball. Straighten out one leg in front of you. 2. Hold onto the table. 3. Keeping the back straight, bring the chest towards the leg, lean forward with the upper body. You should feel a stretch in the hamstring of the straight leg. Hold this position for 10 seconds. 1. Repeat the previous exercise, but when you lean forwards towards the straight leg, pull the toes towards the shin. Feel how the stretch moves into the calf muscles. The following exercise will exercise your legs, stomach and back at the same time. Keep you stomach muscles tight throughout the exercise. 3. Bring your upper body forward until you are able to lift your bottom off the top of the ball. Check your knees are still above your ankles. Hold for 5 to 10 seconds. This entry was posted in back strengthening exercises, ball exercises in work, hamstring stretches, stretches, stretches for lower back pain on November 24, 2013 by flying form.